Stay tuned for additional details about the MegaCon Exclusives & Pin Giveaways, info will be added here when it is available. 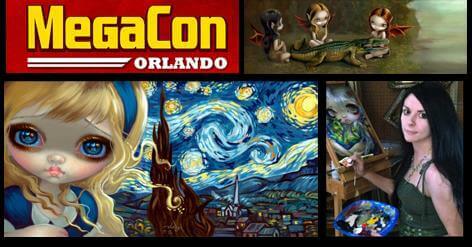 MegaCon is a huge “mega convention” – anime, sci-fi, fantasy, comics, gaming and more. It is at the Orange County Convention Center (fabulous location – by Disney, Universal, etc. if you want to make a weekend of it). Jasmine is am NOT in the “artist alley” – she is an Exhibitor in the large part of the room and will have TONS of artwork, merchandise, collectible enamel pins (including the new MegaCon Exlusives, original paintings, books, oracle cards, open edition canvases, mini prints, Canvas Cuties, coloring books, paper prints, tarot cards, jewelry, figurines & more. Again, Matt, Chris and Amber will be running the booth and Jasmine will be in attendance in person each day for specific scheduled times for autographing – times posted above. Her artwork will be available for purchase all day for all four days of the event. We will happily accept Visa, Mastercard, American Express, Discover, and of course cash.